Summary: In this chapter from Family Dialogue Journals: School-Home Partnerships That Support Student Learning, the authors discuss what they have learned from families and how family funds of knowledge became central to their curriculum, creating what they call a “connectional curriculum”—practices that link classroom learning with families and communities. 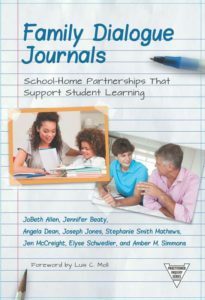 There are many K-12 examples of ways teachers, students, families and communities have used family dialogue journals (FDJs) to support the use of family funds of knowledge, to build community, and to encourage critical thinking about social issues. This is a rich resource for those engaged in family and community outreach and youth programming. Journals allow students, parents, and teachers to engage actively as they question and reason together. Inquiry has the power to transform a list of learning objectives into powerful topics of discussion and negotiation. As we participated in a more inquiry-based approach in our classrooms, we found that because students are learning and understanding at a deeper level as they engage with the journals and their family members, there is actually enough time to fit it all in. More importantly, our students retained the knowledge much better because of the active role they played in questioning, inquiring, and learning.